These Canadian down and feather company quilted goose feather pillows are soooooo incredibly comfortable. Soft but firm, they keep the "karate" chop look. Diamond Quilted Shell / 255 Thread Count - Prevents Feather from escaping, 100% Cotton - Fine cotton allows the feather to breathe, Small White Goose Feather - Filled with Small White Goose Feather to provide better lofting and insulation, Hypo Allergenic - Anti-Microbial process used to eliminate bacteria, Guaranteed Quality - Guaranteed against manufacturing defects for 1 Year. With proper use and care, this product may last a lifetime. With proper use and care, this product may last a lifetime. Perfect feather pillow. Properly covered to prevent most feathers from poking through. It is a great firmness for me - it will squish if I want to, but remains firm under my head while lying on my back. Will be buying more. This pillow is just ok, not a bad pillow but I am a side slipper so I got the firm pillow. At first it seems fluffy enough but the feathers move so much at it and there is no encasement to keep them in the middle to support the neck that I often end up waking up with neck ache because the pillow sunk. There is another pillow by this same company with an encasement to keep the feathers in the middle if I end up buying another feather pillow I will get one like that next time. This pillow is very high quality and very firm. I recommend it for anyone who enjoys extra support for their head. It does shed a few feathers now and then otherwise a 5. Softest pillow ever, I"ll never be able to go back to a non-feather pillow now. 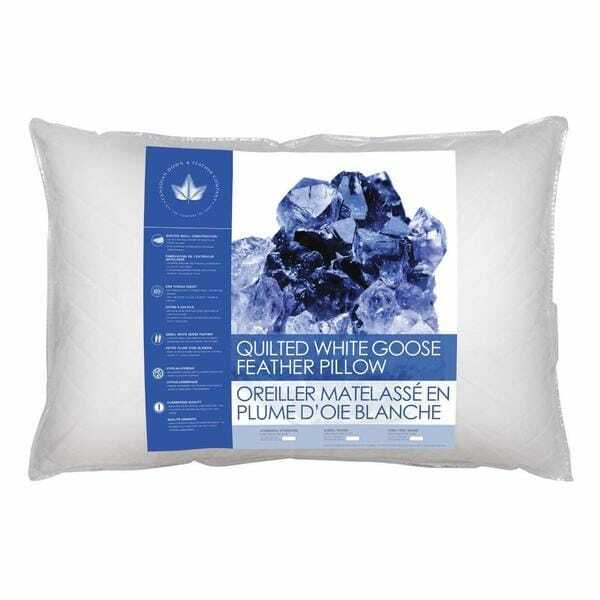 I chose this product because I like Canadian Down and Feather White Goose Quilted Feather Pillows.